LoneMeow is my co-host this game. Any questions can be directed towards him or myself. Sun Tzu said, "The supreme art of war is to subdue the enemy without fighting." This is also true in rhetoric. The best way to get a belief accepted is to fool people into thinking that they have already accepted it. The game is typically very active, so the thread may grow large quickly. However, it is essential to read the thread to play the game. If you do not have the time or patience to read the whole thread, do not play. This game will include flavor that is added for fun and effect, but has no impact on game mechanics. The standard rule set for newbie games will be used and follows below. Please note that that we are using the Voting tool and that there is a Deadline poll. 6. Posting any PM you receive from a host. 10. Sharing accounts with other players. Only you may post on your account. 11. You may not reveal or hint about the identity of your coach. You may not refer to any idea, course of action, etc. as something that was suggested by your coach. If you feel that any action you are considering may be against the spirit of the game, it is best to contact a host and ensure it is allowed before proceeding. The color blue is reserved for the hosts of the game to make our posts easy to notice. Please do not use it. The color green is reserved for questions by players for the hosts. Use it to ask the game hosts questions about the rules. Please do us a favor and read the rules before you ask anything. You must make at least Five posts in this thread per day/night cycle and vote every day while you are alive. Roughly speaking, this equates to a bare minimum of one post per 10 hours. If you fail to do so, you will be modkilled or replaced. Editing is not allowed for any reason. Editing will result in a warning. After that, you will be modkilled. This is the one part of the site where it is okay to be double posting, even triple-posting. "Editing" includes indirect editing like linking an image, then editing the image. Editing your profile or signature are allowed, but if you edit them for any game-related reasons (ie, breadcrumbing, sending messages, etc) this will be considered out-of-thread posting and will be punished. If you want to post something insulting or inappropriate and know the TL mods would have a problem with it elsewhere, don't post it here. If you do, a host will warn you or modkill you and request that you be banned from future games. The hosts have the final say on what is inappropriate. If you do not like how someone is talking to you, please PM a host, Flamewheel, or Mig before involving the TL moderation staff or using the report post link. If you are unsatisfied with how the situation is resolved, then you can appeal to the TL staff normally. It is common for mafia to use a medium outside of TL such as QuickTopics or IRC to communicate during the game. Players who have not explicitly been given permission to communicate outside the thread are not allowed to attempt to infiltrate such communication channels. Players who are not mafia are not allowed to communicate about this game outside of the thread. 1. Voting is done by posting in this thread. 2. Please vote in the following format: ##Vote: Zona or ##Vote Zona. Votes must be in bold, and votes not written in the correct fashion will not be counted. 4. You may vote only for other living players in the thread. You may not vote for yourself. 5. This game uses plurality voting, so whoever has the most votes at the end of the day is lynched. There is no minimum number of votes required to lynch someone. If there is a tie for most votes, whoever most recently had more votes than the other is the person who is up for the lynch. 6. The person who is up for the lynch is whoever has the most votes. Bringing another player up to that number of votes doesn't put him up for the lynch; he has to have the most votes. 7. Voting is mandatory. You may NOT abstain. 7 spots in this game are reserved for new players*. The other 6 spots in this game are open to anyone, but new players still take priority and can possibly bump other players from these spots. These numbers are flexible, but the goal is to bring new members in and give them a chance to play. If you're a forum regular, please bear in mind there will be newbies in this game and act appropriately to introduce them to TL Mafia. Signup for the game by posting /in in the thread if you are new, or /in: Open if you are not. This game follows the TL Mafia Ban List. If you are modkilled, your punishment will go beyond being eliminated from this game. Please refer to it for questions about your punishment. If you want to use this game to sit out your ban, please post in the Ban List. This game uses replacements. Players who are inactive may be replaced by other players. PMs and out of thread communication are not allowed in this game, unless your role explicitly allows them. This game will follow a 48 hour day/24 hour night cycle. Any votes after the deadline will not count and the game will be put on hold until the night post is up. The deadline for each cycle will be 19:00 GMT (+00:00). This is a tentative deadline, please vote in the poll if you strongly prefer another deadline. Thanks to Zona, who inspired me to make this game, and designed this setup. 1.It's already in the rules, but remember, no editing. If you feel you must correct your post, please make a second post to clarify your statements. You may put EBWOP ("Edit by way of post," a handy acronym invented by semioldguy) at the beginning of your post to indicate that you are clearing up a point you made. If your EBWOP post is several posts after your original, please quote your original post in your EBWOP post for the sake of clarity. 2. Only sign up if you know you will have the time available to properly play the game. It is essential that players remain active in a newbie game, so only /in if you are able to play to your fullest. 3. If there is any sort of issue, you are unsure about some mechanic, or you are just wondering if your devilish scheme is even allowed, feel free to PM me, or ask in-thread with green text. Don't feel shy; these games are meant to be a place to learn and be open. 4. Behave as gentlemen (or ladies). Things get heated here, but personal attacks will not be acceptable, and will be dealt with accordingly. Remember, this is a game; have fun and happy scumhunting! 5. Please do not talk about any ongoing games either in-game or pre-game. This can affect other games and is unacceptable. Please do not refer to outside-of- thread activity of players in this thread. 6. If you receive coaching, don't tell town about it. 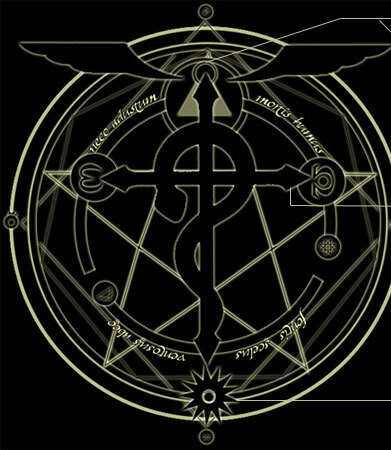 The State Military of Amestris has been unknowingly infiltrated by a subversive group of homunculi - a human-like creature with unique abilities. While there have been rumors of homunculi for millennia most dismissed them as pure legend or fairtale. Their motives are unknown, though odd reports and rumor suggest a little about their abilities. Members of the State Military are tasked with identifying the subversive group of homunculi and eliminating them from the ranks, they win when no homunculi remain. The homunculi enjoy watching the humans argue and kill each other so they prefer to stay in the shadows picking them off one by one. They will patiently play this game until they outnumber the humans, or it is impossible to stop them achieving this. Sometime before the war in Ishbal a secret meeting was called for a small group of the state military. Only certain individuals were given an invitation, some high ranking and well known State Alchemists, some lowly military personalities, all were curious as to the nature of this meeting. Upon arrival of 13 of the invitees the meeting was reveled to be a trap, the goal of which was to reveal the identities of the three homunculi who had infiltrated the military. The members in attendance is know to the homunculi, however most well known figuers who were in attendance came well disguised. As such the homunculi know the details of who is at the meeting, but not their exact identities. Based on where people were stationed however it stands to reason that only certain people had time to respond to the summons and be in attendance. A clever person could easily work out that one of four possible groups of attendees is possible, but it is not easy to be certain which. The homunculli will know which of these is accurate, but members of the State will not. Military Dog (VT): You are just a low level grunt of the state military. You aren't an alchemist, you don't have any special abilities, however you are a member of the State and have a duty to uphold the foundations and integrity of that State. Use your voice and your vote to identify the homunculi, you win with the State. Alex Louis Armstrong (Veteran): You are Alex Louis Armstrong, third in the line of Armstrong Alchemists, the Strong Arm Alchemist! Ok you're a towering wall of muscle that is somehow always beaming at the world, nobody wants to mess with you. Even if someone were to try it would take a hell of a lot of effort as you backup that smile and muscle with generations old fighting technique and impressive rock based alchemy. It will take more than one attempt to kill you off, unless your abilities are neutralized (only protects nighttime KP). You win with the State. Roy Mustang (Vigilante): You are Roy Mustang the Flame Alchemist, a complicated man who rarely shows his true intentions. You've suspected that there is something rotten in the military for some time, and are willing to take matters into your own hands if need be. Just be careful with that flame alchemy, you still need to identify the body after. Once per game, at night, you may choose to target a player and incinerate them. You will only be able to do this once, however if your attempt is blocked you will be able to try again. You win with the State. Maes Hughes (Cop): You are Maes Hughes, you aren't a State Alchemist but you've worked in the Investigative departments for a long time and have gotten quite good at your job. Spreading and sharing gossip all the time tends to help you pick up on all the little secret things going on that nobody really wants anyone to know about. At night you may choose to investigate another player and will learn if they are a Member of the State or A Homunculis . You win with the State. Tim Marcoh (Doctor): You are Tim Marcoh the Crystal Alchemist, you are a State Alchemist with a vast knowledge regarding the philosopher stone. As one of the oldest state alchemists alive you are not a fighter, but draw upon your knowledge to aid your allies. You already have some basic training as a physician but have been using alchemy and some stone fragments to improve your abilities. At night you are able to visit a player and heal their wounds if they were targeted. You win with the State. Pride aka King Bradley (Godfather): You are Pride, known as King Bradley to the humans. You lead the foolish humans without them ever guessing your true nature. Hiding in plain sight you command respect and obedience with you're very presence, and almost nobody would dare defy you, much less question your loyalty. You return as Member of the State to investigative checks. Sloth (Roleblocker): You are Sloth, the embodiment of laziness and wasted potential. You posses very formidable talents and would be a very tough opponent for anyone who dares challenge you, luckily for the humans around you you prefer to simply lay low and only show your talents when absolutely necessary. You have the unique ability to project the nature of sloth onto others, thereby making them unable to utilize their own potential. Every night you are alive you will be able to target a player and deprive them of any actions they might have been able to take (not effective against other homunculi). Gluttony (Goon): You are Gluttony, the embodiment of overindulgence and hunger. You are able to eat just about anything and your stomach is practically a universe into itself and always has room for more. Unfortunately this means your stomach is always rumbling and you are unable to focus on anything other than eating for very long. While you are as formidable as any of the homunculi your inability to focus on anything but food leaves you lacking any special abilities and are often used as a grunt by the other homunculi. You don't mind though, as long as the others let you feast every so often. This section is intended to add flavor and fun to the game, however it is based on the standard setup outlined below. This is a mafia game for 13 players. 3 players will be randomly selected as mafia. The town wins when all mafia are eliminated. The mafia wins if the number of mafia players alive is equal or greater to the number of town players alive. When a player dies in the game, the player's alignment (that is, which team the player wins with), and role will be revealed. This reveal is guaranteed to be accurate. The mafia will be informed as to which setup is chosen, but the town will not! You have no special abilities, but your voice and your vote are just as important as anyone else's. You win with the town. Every night, you may choose a player to investigate. You will visit the player and receive "Town-aligned" or "Mafia-aligned" as a result. Your results are guaranteed to be accurate. You win with the town. Every night, you may choose a player other than yourself to protect. You will visit the player, and if the mafia attempt to kill a player you are protecting on the same night, the kill will fail. Both you and your target are notified if you prevent a kill. You win with the town. Once per game, at night, you may select a player to kill. That player is shot overnight and dies at the start of the next day. If your target was also shot by mafia, or was protected by a doctor or veteran status, your bullet is lost. If you were roleblocked, you don't use your bullet and can try againt he next night. You win with the town. You have a bulletproof vest that can absorb one bullet. This means you need to be shot twice in order to die: once to destroy the vest, once to kill you. If you are roleblocked, however, your bulletproof vest doesn't work that night. You are informed if your vest is destroyed by a bullet. You win with the town. Every night, you may choose a player to roleblock, which will prevent them from performing actions and visits that night. The roleblocked player will be notified, even if s/he is vanilla. Every night, the mafia team must choose a player to kill. You may communicate with other members of your mafia team outside of the game thread at any time. You win with the mafia. Every night, the mafia team must choose a player to kil;.You may communicate with other members of your mafia team outside of the game thread at any time. You win with the mafia. You return "town" to cop checks, as though you were a vanilla townie. Every night, the mafia team must choose a player to kill. You may communicate with other members of your mafia team outside of the game thread at any time. You win with the mafia. If there is any confusion about your role PM or the setup, PM me or your coach if you have one. Q: Can good guys communicate outside of the thread? What about just the Cop / Detective? A: The good guys can't communicate outside of the thread. This includes the Cop. Q: I'm confused about some role names that are used interchangeably. Q: Does something extra bad happen to the Doctor if s/he visits a mafia player? Q: I want to talk about coaching, or have a question about coaching. Where should I ask this? A: PM me. Do not post in the thread about coaching. Q: Should I talk about this game anywhere other than this thread? A: No. You can talk in your special Scum Quicktopic if you are Mafia. You can also talk with your coach. Otherwise, do not mention this game. Don't mention it in passing. Don't mention that you're alive. Don't mention that you think your case is good. People in this game read all parts of the forums here on TL, so if you go over the Sc2 Strategy and say "I'm a bad mafia dude in this game" you will get found out. Q: Should I talk about this game anywhere other than this thread if I'm dead? A: When you die I will provide you with a quicktopic for dead players to hang out in and discuss the game. Q: Can town decide to "sleep" or vote for a no-lynch? A: You are allowed to vote for a no-lynch. Q: The deadline passed and the Host hasn't finished writing the Day post or Night post. During these minutes between the lynch ending, or between the night ending, and the start of the next phase, can I talk? A: Do not talk if the day or night post is late. After the lynch or the night kills have been 100% determined, in theory the next day should start instantly. In practice, it takes me some time to compose the new post, and during this time you should quietly wait for the flip. Typically there's a delay of between 1 and 10 minutes. Please only vote if you are playing or co-hosting. Poll: What Deadline works best? Your vote: What Deadline works best? By fullmetal is it fullmetal alchemist? /in cohost if GB wants to play. Nice armor. Must have cost you an arm and a leg. Do you know that girl from our neighborhood? She loves her dog so much she is inseparable from it. When do you guys plan on starting? If the start is next Monday or later I will in so hard. Looking forward seeing the flavor for this. ~2weeks to fill out the player list seems normal, but you never know. Welcome back! Hopefully you get a little breathing room after everythingwinds down for ya. Hopefully I'll get the flavor done today, but tomorrow for sure. Yeah, but it can be a bit strange. Sometimes it is like "oh they still need 50% of the players", then it fills up in half a day. Since NSM XVI started not long ago, I guess it will be a bit of time before this one fills up. I also hope that I get a bit of a breathing room, but I already have a bunch of stuff I need to take care off lined up. So meh. No rest for the wicked. I may change this to coaching depending on how my schedule goes. If both of you really want to cohost we can roll with a 4 man hosting team. Given my schedule can be erratic at times and it's my first time hosting it might not be a bad idea to have a larger than normal hosting team. I'll wait to officially add anyone till you confirm with me that you prefer to cohost. Don't want to miss a chance to play with Blazinghand. Must be wonderful to be free! Vlad for life. SKT supporter. I policy lynch all dota players, end of.